A new anti-tamper technology with aims similar to those of Denuvo has been rapidly defeated. Valeroa has been touting itself as the latest anti-tamper technology "that cannot be cracked in a reasonable time." However, after appearing for the first time on the game City Patrol: Police, a cracker says he defeated the system in just 20 mins. With online piracy still running rampant, content producers are keen to prevent copying wherever they can. Music and movies are extremely vulnerable, with no effective technology available after several decades of trying. However, software and video games are able to put up a bit more of a fight when appropriate DRM and other technologies are put in place. Situated on top of regular DRM, Denuvo has made its way to the top of the pile as one of the most effective and hated (by pirates at least) anti-tamper technologies. This reputation has in part been earned through its ability to prevent low-level crackers from defeating its locks but also due to a perception that it can be anti-consumer. With this reputation, Denuvo is consistently targeted by crackers, who are getting more and more successful in defeating the technology. A few days’ protection now seems to be the most the product can offer, with the company itself now openly suggesting that a couple of weeks’ protection is a reasonable aim and valuable in itself. Given Denuvo’s profile, it was interesting to see an apparently new technology being touted by its makers a few months ago. Dubbed ‘Valeroa‘, this new kid on the anti-tamper block seems to have Denuvo in its sights, with interesting marketing which presents the tech as a more consumer-friendly tool to achieve the same aims. “Valeroa anti-tamper does [not] require you to have an internet connection. Not even when you launch your game for the first time or after you upgraded your hardware. Some games require you to be online, but this is not a Valeroa requirement,” the company claims. On Saturday December 1, two days after launch, the game appeared online with its protection cracked. A user known online as ‘Steam006’ (who claims to be from Turkey) was reportedly responsible and if his report is to be believed, Valeroa didn’t put up much of a fight. However, an early version of the website claimed the company was situated in France, offering the address 54-56 Avenue Hoche, Paris 75008. 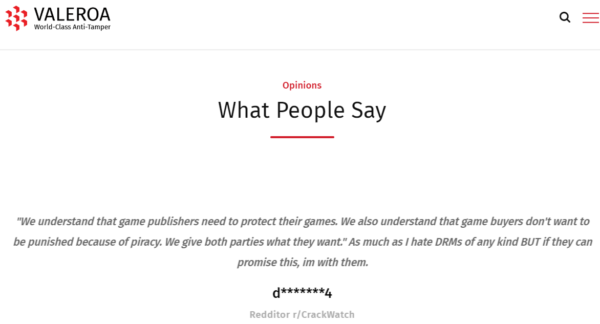 Adding to the unconventional approach, the site’s promotional material actually carries comments from users of Reddit’s /r/crackwatch forum which stop short of commending the technology but cautiously praise it for being less anti-consumer than some alternatives. Valeroa cites Crackwatch user? Whatever next.. While Valeroa fell quickly on this first occasion, it did manage to hold up as long as some of the latest variations of Denuvo, which is an achievement in itself, if one discounts the low interest in the game itself. “[T]he individual / group behind ‘Steam006’ released a pirated version of the title in question 2.5 days after its release. Technically Steam006 did not crack the anti-tamper solution in 20 minutes as it was used on emulation tool he worked on for years. This tool does not attack that is protected by the anti-tamper,” the statement reads.